School, State, National Level Painting Competitions on Energy Conservation 2017: Introduction: The Ministry of Power has launched the National Awareness Campaign in order to promote energy conservation in the country. Painting competition for students at the School, State and at National level has been included as one of the activities of the campaign, which would not only make aware the children about the need of conserving energy but at the same time would educate and involve their parents as well in the above cause. The identified activity is one of the measures, which can help in creating awareness in the domestic sector. In order to strengthen and for added cognizance, higher classes of 7th, 8th and 9th standards have been included from 2013 in addition to existing classes of 4th, 5th and 6th Standards. The competition is being held at three stages, namely, School, State and National Level. Students of 4th, 5th and 6th standards under Group ‘A’ and of 7th, 8th& 9th standards under Group ‘B’ are eligible to participate in the competition. Cash prizes worth Rs 95,000 per State/UT per Group (Rs. 34.20 lakhs for 36 States/UTs) will be distributed to State level winners on day of the Competition on 14th November, 2017. For winners of both the Groups of National Competition, cash prizes worth Rs. 10.35 lakhs will be awarded by the Ministry of Power on 14th December, 2017 which is also celebrated as National Energy Conservation day in the presence of eminent dignitaries holding very high positions in the Government. Kind Attn: Principal/Vice- Principal/Head Master/ Head Mistress Sub: School, State & National level Painting Competition on Energy Conservation-2017 for Group ‘A’ (4th, 5th & 6th standard students) and Group ‘B'(7th, 8th & 9th Standard students). n the outlook of sensitizing the school children towards Energy Efficiency along with Energy Conservation in domestic sector, the Ministry of Power (MoP), Government of India (GoI) undertakes pan India National Awareness Campaign by organizing Painting Competition for 4th, 5th and 6th Standards under Group ‘A’ and for 7th, 8th and 9th standards under Group ‘B’. As may be seen, the competition is being held in three stages, namely, School, State and National Level. Students under Group ‘A’ and ‘B’ are eligible to participate in the competition. Cash prizes worth ₹ 95,000 per State/UT per Category (₹ 34.20 lakhs for 36 States/UTs per Category or ₹ 68.40 lakhs for both Categories) will be distributed to State level winners on day of the Competition on 14th November, 2017. For winners of both the categories of National Competition, cash prizes worth ₹ 10.35 lakhs will be awarded on 14th December, 2017. Therefore, in total ₹ 78.75 lakhs as prize money will be distributed in the painting competition scheme. It is informed that all the participating students of School level painting competition will get a ‘Certificate of participation’ and 1st & 2nd selected will get ‘Certificate of Merit’ which will be signed by the respective school Principals and Director General, Bureau of Energy Efficiency, Ministry of Power, Government of India. It is further informed that the names of schools, recording 100% student participation in the categories ‘A’ & ‘B’ (as applicable), will be included in the Painting Competition Book prepared by BEE. The Bureau of Energy Efficiency (Ministry of Power, Government of India) takes this opportunity to request school principals to encourage their students to participate in this National activity. a. 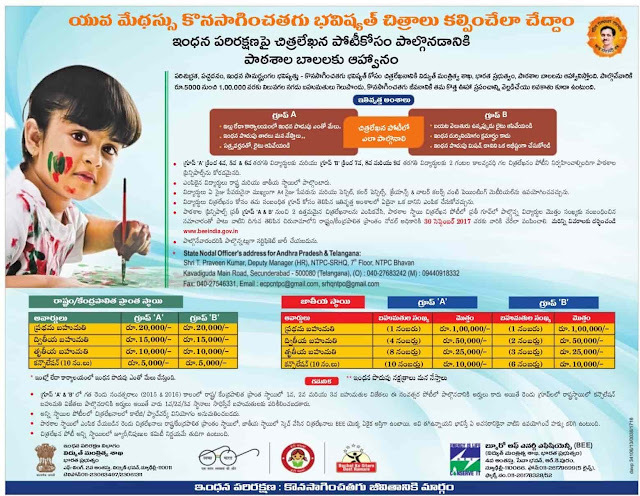 School Level Painting Competition 2017 for the students of 4th, 5th and 6th standards under Group ‘A’ and of 7th, 8th & 9th standards under Group ‘B’ has been launched in all the States/UTs through an advertisement in the print media starting from July, 2017 by Bureau of Energy Efficiency (BEE). The children can use Pencil, Pencil Colour, Crayons, Water Colour etc. The children may consider the following points while painting.• The entry can be poster or a painting. • Use of Collage/Patchwork is not permitted. • Individual Jury member will have to give marks (evaluate) to paintings on the following points to arrive at final decision. i. Relevance of the theme depicting the selected topics. iii. Overall visual appeal, handling of given space and use of appropriate colour combination. d. Two best paintings along with information on the total no. of participants, percentage participation of students in both Groups i.e ‘A’ & ‘B’ ( as applicable) and send them to the address of the Nodal Officer (list attached) of their respective State/UT before 30th September, 2017. All the participating students at School level painting competition will get a ‘Certificate of Participation’and 1st & 2nd selected will get ‘Certificate of Merit’which will be signed by School Principal and Director General – Bureau of Energy Efficiency, Ministry of Power (Government of India).g. List of the Nodal officials for all the States/UTs is given in List of State Nodal Officials (doc format)h. Paintings not signed by the school principal or sent directly by student’s parents will not be accepted. i. Paintings are to be sent only at the address of respective Nodal Official of the State/UT and not on the addresses of Ministry of Power and Bureau of Energy Efficiency. These schools are requested to send two best paintings directly, along with the details as mentioned above, at the Bureau of Energy Efficiency (BEE), Sewa Bhawan, R.K.Puram, Sector-1, New Delhi-110066 (INDIA) office address. k. It is to be mentioned that those schools who would record 100% participation for each Group ‘A’ & ‘B’ (as applicable) at the School level Painting Competition, their names will be included in the Painting Competition booklet prepared by BEE. l. 1st, 2nd & 3rd prize winners from the year 2015 & 2016 of Group ‘A’ (4th, 5th and 6th Standards) and Group ‘B’ (7th, 8th and 9th standards) at State Level will not be eligible to participate at any level of competition. However, students who have earlier won consolation prizes during the last two years in Group ‘A’ and Group ‘B’ at State level would be eligible to participate in the Painting Competition 2017 but they would not be considered again for the consolation prizes at the State level. They will only be considered for prizes, if they win 1st / 2nd /3rd Prize at the State level. a. A common committee/jury comprising of 5 to 7 renowned persons in Art, drawing teachers, officials from organizers and State government education department will be constituted by the Nodal officials for selecting up to 50 best paintings each for Group ‘A’ & ‘B’ out of the total numbers of the paintings sent by the respective School Principal of the State/UT. c. Nodal officials will also communicate with the respective school principals by 1st November, 2017 through letters, fax, telegrams, telephones, email etc. about the selection of their students and also request them to send the selected school student to participate in State level painting competition on 14th November, 2017 at the selected venue and timings. Tentatively, this venue may be the State capital. • A letter from respective school principal certifying the student’s particulars or Identity Card. • Painting material: pencil, crayons, colored pencils, water colors. • Nodal Officials will conduct the on-the-spot painting competition of 2 hours duration at the predetermined venue on 14th November 2017 .
e. Schools/parents to bring the children to the venue and take back the children to their respective places. The selected students reporting at the venue of competition will be paid Rs 2000/- each in cash by the nodal official on the day of their participation at State level painting competition and reimburse sleeper AC Chair Car class/3rd AC rail-fare/ State Roadways bus fare from the shortest route for self and two guardians. The Nodal official will also provide refreshments/lunch to the participating students and their guardians. The chief guest of the function would give away the prizes to winning students.h. Two separate Group photographs of participating students along with Chief Guest and respective Nodal official will also to be arranged.i. Students participating at State/UT level painting competition will be given some mementoes by the Nodal Officials and Certificate of participation. j. Competition for Group ‘B’ will be terminated at State level and the first three selected entries from each State/UT to be sent to BEE by 18th November 2017 for their selection for National level prizes. a. The first, second and third prize winners of Group ‘A’ of the each State/UT level painting competition along with their guardian (restricted to two adults per student), will be invited to Delhi to participate in the National Level Painting competition of 2 hours duration on 12th December, 2017.
b. Only paintings of 1st, 2nd and 3rd prize winners of State Level Painting Competition of the Group ‘B’from each State/UT will be evaluated at Delhi by a Committee of Experts/Jury nominated for their selection for National level prizes. ii. Painting material: crayons, colored pencils, water colors. The participating students at the National level painting competition will be requested to stay back till 14th December, 2017 so that they can participate in the National Energy Conservation Day function and winning Students can receive the prizes from the Chief Guest.4. Awards for State/UT Education Department and State/UT Nodal Officer• Efforts of the States/UTs Government Education Departments and State/ UT Nodal Officers who have made concerted efforts to support the Painting Competition under the National Campaign for Energy Conservation of Ministry of Power will be awarded. 1. The decision of the Jury/Expert committee at all levels of the painting competition will be final. 2. Two paintings selected at school Level, paintings at State and National Level would be the sole property of BEE, which will have the right to use it for any purpose it consider appropriate. 3. The 1st, 2nd and 3rd winner of State/UT level Painting Competition of Group ‘A’ shall not repeat or draw the same painting at National Level and if found so he/she shall stand a chance for elimination for awards.